Anyway, you may recall that I made this quilt so that I could use up some of the Little Folks scraps left over from my voile string quilt. I just couldn’t bear to see those fabulous fabrics go to waste, so this design was perfect, since it only uses up tiny little scraps. It took me a while to decide how to quilt it. I decided that I didn’t want any quilting lines to go through the printed fabric bits, so I ended up with this straight line quilting on the diagonal. This worked to outline each of the farfalles (what is the plural of ‘farfalle’ anyway?! ), highlighting each one in its own little diamond. I love it. I knew I wanted gray for the backing, since I really love how gray looks with all these colorful bits. I was practically out of my favorite Kona Coal, so I went with a Kona medium gray, with a bit of the coal as a strip on the side. There’s a little strip of the dobby dots in raspberry, which looks so fabulous with the gray, and a little pieced section where I ran out of gray. I’m definitely in love, and I think this one’s a keeper! Fabrics used: Ikea white sheet, Anna Maria Horner Little Folks voile scraps, Kona Coal & Medium Gray for backing, with extra pieces of Little Folks voile. This entry was posted in [search] Liberated Quilts, 2010 Finished Quilts, Finished Quilts, Posts about Quilts, Quilts and tagged anna maria horner, exquisite block, fabric scraps, handmade, little folks, quilt, quilting, scrappy, voile. Bookmark the permalink. 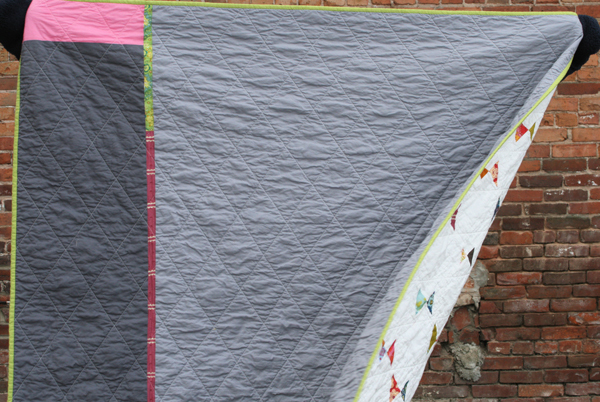 68 Responses to and I present to you… the flying farfalle quilt! This quilt is SO fun!!! Its amazing how just a little bit of color can do so much, isn’t it? Nicely done, Ashley!! Your quilt is beautiful ! I adore this one – I don’t think I’d be able to be parted with it either – a keeper for definite. I have an accidental fafalle on the back of a crazy quit sampler that I’ve always been very fond of although my mum could never understand why I’d used “different fabric” and regarded it as an unfortunate and undisguised mistake. Long live the farfalle butterflies! Oh, I love it! Gorgeous!! You are an inspiration to those of us who are beginner quilters. It IS a great looking quilt! Wow! I loved the top, but the quilting takes it over the top. Having a little frame for each set of triangles is just perfect. Also, I am a dork and looked up farfalle–in case you are curious, farfalle is the plural, and the singular is farfalla. I bet I could make this one with a blue sky background and bright colors for the “birdies” we’ll have to say because I can’t very well make a blanket for boys with “farfalle” on it can I? On another note I thought you might like the link below, it has the pronunciation for the word. Turn up the volume on the computer click the red speaker and it will say it for you! I never even knew what they were until now! You learn something new everyday right? I love this quilt too!! I have been saving my triangles too, so that I can make one like this. Although I am sad to say that I have been throwing away my string quilt traingles!! 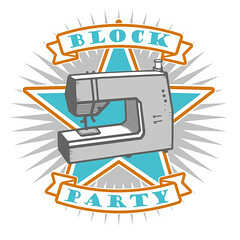 I want to make this one but stitch in attenas (sp) and turn them into butterflies!! But I like this too! So maybe I will make two! I also love your quilt design too! Makes them stand out! i love this quilt, and yes i love and laughed at the name. they look just like those little butterfly noodles/farfalle! just perfect! Really stunning. Just like a sprinkling of jewels. Oh this is just wonderful! I especially like how your quilting highlights each little block! I love this quilt – so simple but really effective. I shall definitely be adding it to my To Make list! Absolutely stunning! Will be tucking this idea away for the future, including using the IKEA sheet as background. The quilting you chose is completely and absolutely perfect. Headed to an IKEA next week and I’ll be picking up a few of those white sheets! Such a great idea. Your quilt is beautiful! Let us know how the Ikea sheet holds up after washes. I’m nervous to try it because I recently spent big bucks at a department store for nice sheets and they “pilled” after only 2 or 3 washings. If the Ikea ones hold out, I’m going to use that for white too. BTW, I LOVE THIS QUILT! I should have said that first, LOL. Love, love love it. And I love the name too! That is so friggin’ fantastic! Love, love, love it!! 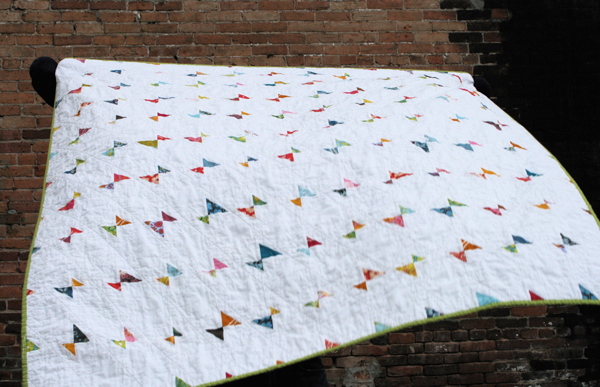 Ashley – it’s fantastic – and I love the quilting! I love it! What great use of scraps and the quilting is wonderful. I love the way it makes the diamonds. I love it! I made a teeny one very similar to this one last summer that I donated to AAQI…it was a lot of fun to make! That quilting was a perfect choice! Love it love it love it. 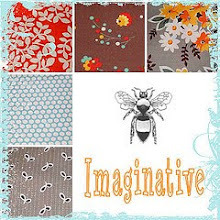 I really like the imaginative use of scraps especially when it is a fabric line you love. Nicely done, as always. Love the almost antique feel of this, with the abundance of white. Cute, cute! I have a ton of leftover triangles that I clipped from my Modern Siggy Blocks for the p.s. i quilt swap — perhaps if I’m feeling particularly ambitious they might end up as pasta, too. Your blog is such a fun journal to read through…always inspiring, and I am always admiring! I love it! Very classic-looking quilt. This is perfect! great job! 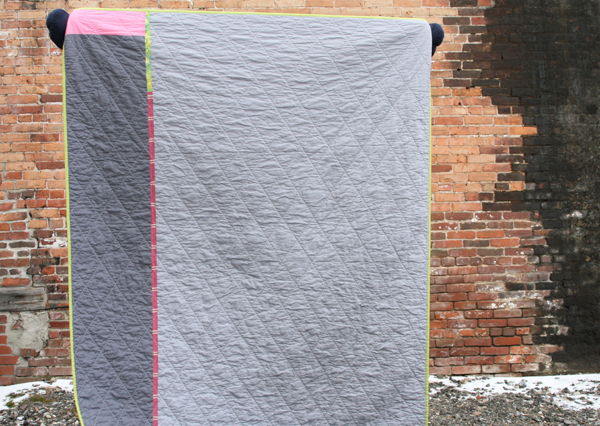 I love everything about this quilt – the front the back, the quilting – it’s all delicious! I really love this one! I love the name you gave – so fitting. And I love how you used those fabulous scraps. Oh yeah, the quilting lines really make the farfalle pop too. Great job with this one! Simple. Sweet. Stunning! . . . . reminds me of early spring flowers peeking through the long winter’s snow. Beautiful back too! Love it all. 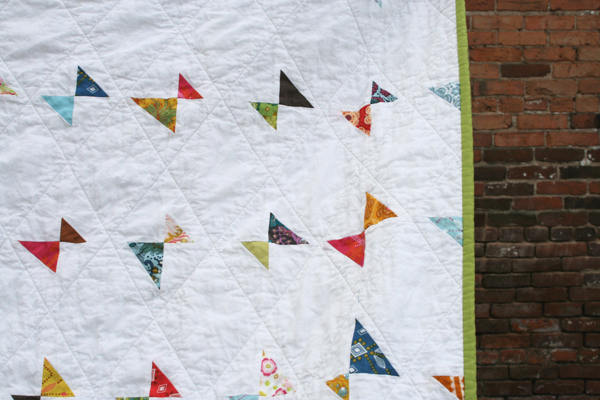 I like the triangle quilting. Looks really nice. Lovely! It’s great how the quilting shows off the piecing. Was the ikea sheet 100% cotton? I’m been thinking of trying to use sheets as backing but most are a cotton/poly blend and I’m wondering how that will work out. Beautiful! 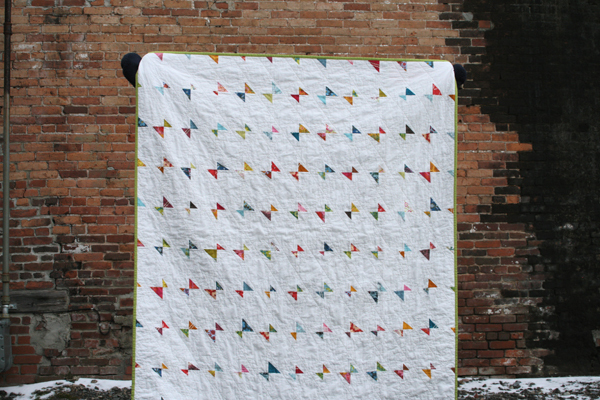 I love all the white you use in your quilts, and especially how it showcases those beautiful LF scraps. I’ve been using IKEA sheets, too, but I’m still a very new quilter and I have a question that maybe you can address in one of your posts…how do you manage cutting very large swaths of fabric into manageable, and straight, pieces? I’ve tried a couple different things, but almost always wind up with wonky edges. Do you just not worry about it and straighten things out in the sewing? Any tips are much appreciated!!! I love it it is sooo cute!!! This has to be one of my favorites too. Great choice in color and quilting design. This quilt is a great way to use all the little scraps you have. Im think that the solid for the back was a great choice it really balances out the color in the front. You also always manage to find new and better places to shoot your pictures. I don’t know where you find such unique places in Vermont but great job. Beautiful, just so wonderful. I love the back too – every detail is perfect here! Awesome! I was just looking at Kona solids deciding what to pair with my Little Folks quilt top… I had decided on Coal too… Do you know anywhere I can buy it online? I can’t find it locally anywhere. Thanks for the inspiration always! I’m Italian so I can tell you it’s pronounced Far-fall(but the a is the same sound of fAr)-eh… the eh sound is a bit complicated because it doesn’t exist in English, well it’s the beginning sound of ay, without closing the a into an y. Ok, it doesn’t make sense… I’ll have to phone you! Ashley your quilt is absolutely beautiful! This is soo great, and a great idea for using scraps. I might borrow this idea to use up a bag of vintage scraps that my grandmother gave me. What a beautiful quilt! Love the little bits of bright colors! Wow, !! Absolutely stunning. Love the beautiful bits of colour. Your style of quilting is such and inspiration. Any chance you could do a quick tutorial on how to make these blocks easy? I can’t really figure out a method for all the wonky triangles I have. Very nice. I really like your choice of quilting stitch design. Perfect for the little triangles! Great quilt! And, remember, you can always google a word and use dictionary entries for pronunciation. Most of them have audio even! That is the only way I know to pronounce anything! I really love this. I second that a tutorial would be great. I have a ton of tiny scraps I just cant toss. I am so in love with this quilt! I have a scrap bin that I am pretty attached to, I’m thinking this quilt could be the solution. This quilt is gorgeous. I love simple and understated, and this fits the bill perfectly. A good contrast to your string quilt top. I also forgot to tell you, but you might know already, that beside being a type of pasta, “farfalle” actually means “butterflies”. So the name really fits!! this is so very fantastic!!! i started something like this last fall and i was going to add a bunch of different borders, but after seeing your simple version, i think i need to keep going and make mine bigger. this is a wonderful quilt! Pingback: I Love It When People Are Creative. I love this quilt and have started a similar one for my daughter’s first ‘big girl’ bed. It’s my first attempt at a quilt that needs to be (at least approximately) a certain size. So, I have the triangles sewn into the 54 10″ squares I’m using and have laid it out on the floor to rearrange and get the lay-out I want. Now my question is: Any advice or tips for stacking up the squares and sewing them together? I’m planning on stacking each row from left to right, then sewing the rows together from top to bottom. But am open to tips from folks who have done such things! Thanks. Do you remember what size of white blocks (the triangles)you started with by chance?? Thanks, love this!